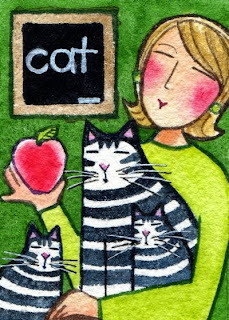 My original ACEO watercolor painting of "Teacher's Pet No. 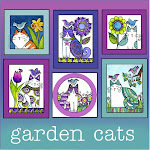 5" was first featured on 365 Cat Ladies and Friends on August 25, 2009. When does the line stop shifting? Own a piece of 365 Cat Ladies History! Teacher's Pet No. 5 is now available in my Etsy shop. 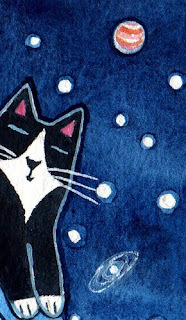 This mini watercolor painting is in ACEO (Art Card Editions and Originals) format, which means that the artwork size is 2.5" x 3.5", the same as a baseball card. It is hand-painted on super-heavy Arches 300-lb. acid-free cold-press watercolor paper with professional quality watercolor paints. Click here for more details. The big weekend is almost upon us. I've made myself a list of things to do. Thanksgiving Thursday: Eat, drink, be merry. Give thanks for my friends, family, pets, cat ladies, pet people, nature lovers and lovely customers who have supported my creative endeavors in so many ways over this past year! Bl ack Friday: Rest, relax and veg out (Buttonwillow demonstrates the proper technique in the photo to the right). Be thankful that I'm "Shopping Small" this year. Small Business Saturday: Rest, relax, and "Shop Small". American Express has spearheaded a movement that asks consumers to patronize small, independent, local, mom and pop businesses this year. "The 2nd annual Small Business Saturday® is a day dedicated to supporting small businesses on one of the busiest shopping weekends of the year. On November 26, we're asking millions of people to Shop Small at their favorite local stores and help fuel the economy. When we all shop small, it will be huge." Simply Sunday: Rest, relax, and alert the elves to prepare for a busy week or two ahead. Cyber Monday: Head back to the workshop and get those elves into high gear! 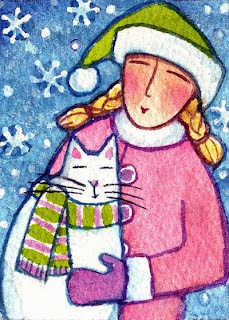 And give thanks again for my friends, family, cat ladies, pet people, nature lovers and lovely customers who have supported my creative endeavors this past year ! 2. With any total purchase of $20 or more from my Etsy Shop, each customer will receive this exclusive mini print of my watercolor painting "Full Moon Serenity" absolutely FREE. 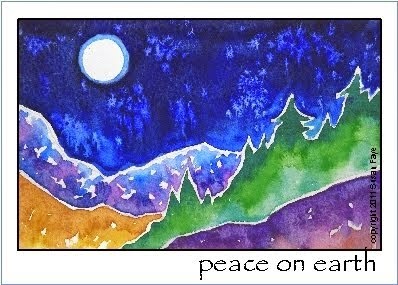 It is 5 x 7" and suitable for framing, or display it on a small tabletop easel or on your fridge or bulletin board. Limit one free print per household. Cat Lover No. 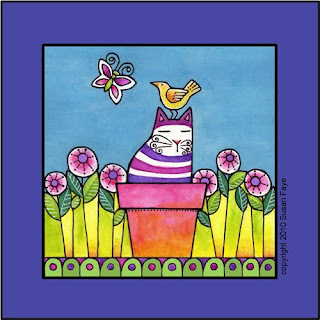 67 was first featured on 365 Cat Ladies on November 12, 2009, and introduced us to World Kindness Day, which takes place in November each year. The Australian Kindness Movement describes an act of kindness as: "a spontaneous gesture of goodwill towards someone or something - our fellow humans, the animal kingdom, and the kingdom of nature. Kind words and deeds come from a state of benevolence, generated by a core response deep within all of us. When we carry out an act of kindness it is a message from one heart to another, an act of love, an unspoken 'I care' statement." Numerous scientific studies show that acts of kindness result in significant health benefits, both physical and mental. Kindness can enhance feelings of emotional resilience, and vigor, and can reduce the unhealthy sense of isolation in both the giver AND the receiver! So let's make every day World Kindness Day towards our fellow humans, our pets, and our planet! It's a win-win proposition. 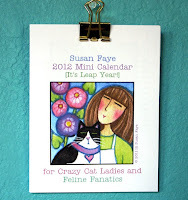 Own a piece of 365 Cat Ladies History! Cat Lover No. 67 is now available in my Etsy shop. 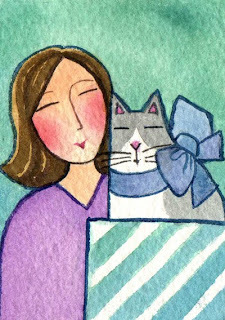 This mini watercolor painting is in ACEO (Art Card Editions and Originals) format, which means that the artwork size is 2.5" x 3.5", the same as a baseball card. It is hand-painted on super-heavy Arches 300-lb. acid-free cold-press watercolor paper with professional quality watercolor paints. Click here for more details. 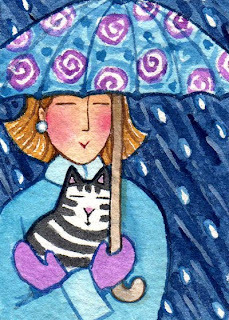 My ACEO artwork of "Raindrops and Kitten No. 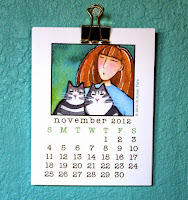 4" was first featured on 365 Cat Ladies on Nov. 6, 2009. It is the size of a baseball card and was painted on super-heavy Arches 300-lb.cold-press watercolor paper with professional quality watercolor paints. I initialed it on front, and signed, dated, and titled it on back. Walking in the rain with a pretty umbrella. Snuggling with a warm and fluffy friend. It's POURING here in the Willamette Valley at this very moment, so I guess it's time to get out the watercolor paints, snuggle up with Buttonwillow, and since it's dark and cold outside, I'll just imagine walking in the rain for now. Click on image above for more information about "Raindrops and Kitten No. 4". A List of Lists and a Freebie For You! 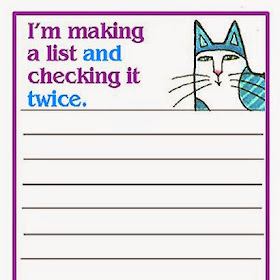 It's that time of year to make lists. Many lists. 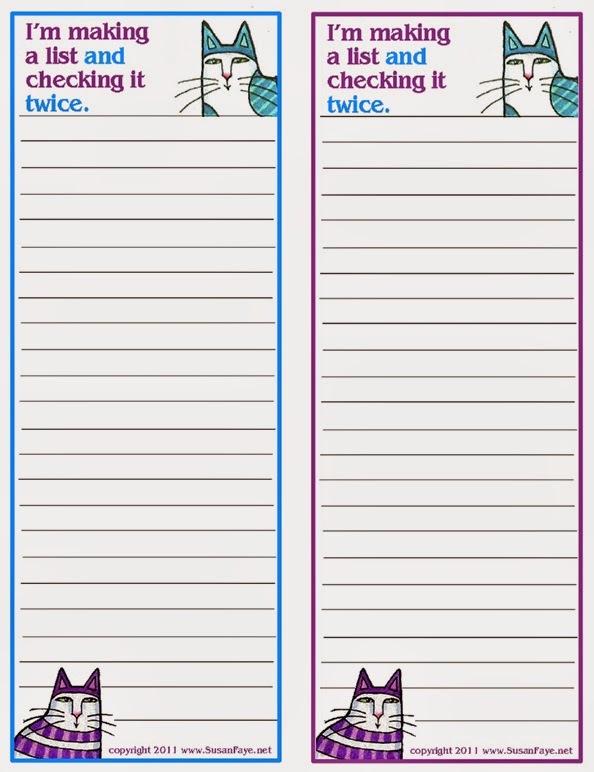 So in order to help you with your list of lists, I have a little gift for you. It's my way of thanking you for your love and your support of my creative endeavors over the past year. you are all tops on my list! Below is a printable list-making page. 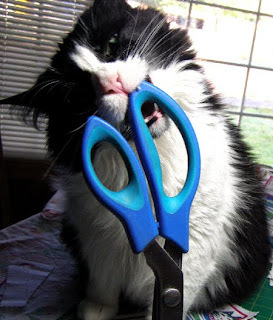 Right-click on the image and use the "save image as" option to save it to your desktop. You should then be able to print it up just like you would any photo. 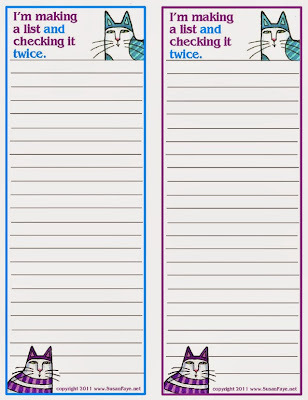 When printed full-size, it should fit on a standard 8.5 x 11" sheet of paper; then just cut it in half to make two lists. So what is tops on your list of lists this week? What lists will you be working on over the coming weeks? Please share in the comments section of this post. Thanks for visiting! Rana Wilson, The "Crafting Enlish Prof", who said... Well, Dobby is named after a house-elf, and wow, should I not have done that. He's very much like Dobby the house-elf, only without the socks... And Buttercup is a not-so-stealthy stealth-licker... LOL! 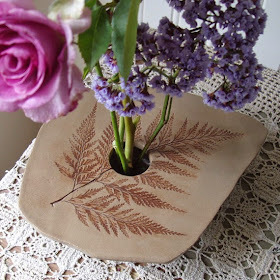 Check out Rana's crafty creations at her Etsy shop Definitive Designs. Cat Lady Jenny said... My cat Milo is a dog in disguise. He carries around pens in his mouth, drinks out of the toilet, and comes when he is called. What a goof. 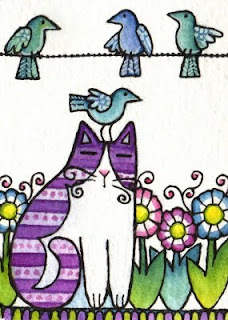 Jenny has a great selection of creations for bird lovers at her Etsy shop A Bird In The Hand Art. You can follow along on her adventures over at her blog Main Street Memories. I love her profile description: "Pretending to be a normal person day after day can be exhausting, so I don't.."
And a big thank you to everyone who participated! Does your pet have a secret identity? Hop on on over to the Secret Identity Giveaway post and share your pet's alter-ego secrets for a chance to win a $30.00 gift certificate to my Etsy Shop. The two runners up will each receive their choice of one of my new calendars, either Cat Lovers or Nature Lovers (a $14.00 value). Giveaway ends TONIGHT, November 13. At 8 p.m.
Amy said... Our Pixel pretends to be Helpful NASA Kitty during the day (http://bit.ly/tjhtDk), but at night he becomes the Sock Monster! (http://bit.ly/vAUwzF) It took us over a year to figure out which cat was behind the mysteriously transported socks! 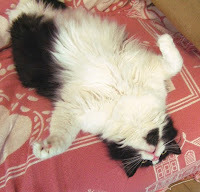 Linda B said... Have 3 cats and they all have jobs, so the last is Fritz, our black cat, the playbaby. His job is to find bottlecaps, milk bottle rings and use the "force" to get me and my husband to play catch. He catches them in mid air and brings it to the other person, so all 3 of us can play. bcbeaveratheart said... My dog Brooklyn is a "Yoga" instructor in her spare time, she is able to preform all kinds of contorted positions, she does the best downward dog yoga position lol. Kimberly W said... I have 2 beautiful Golden Retrievers. "LeeLoo" my 10 year olds secret identity is Wimpy from Popeye, she is always looking for a free meal. And sweet Dollar Bill recently had surgery and has so many staples and stitches we can't help believe she is secretly Frankenstein or as we are calling her "FrankenBill". HornCatCreations said...My cat, "Batman" is a nocturnal florist. He likes to take the flowers from the vase and turn them into abstract surprises on the table. 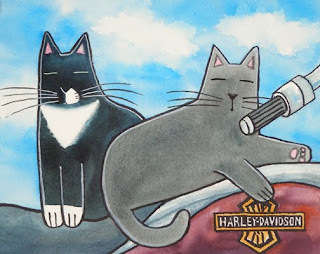 Janine said...One of my 3 cats' secret identity is Evil Knievel. She can jump across anything, including a fish pond! rosewendy said...My dog gained his name shortly after arriving to live with us as a small puppy. His needle sharp baby teeth managed to draw blood at least once a day so my teenage daughter named him Jasper after(an incredibly hot) popular movie vampire. Rana Wilson said...Well, Dobby is named after a house-elf, and wow, should I not have done that. He's very much like Dobby the house-elf, only without the socks... And Buttercup is a not-so-stealthy stealth-licker... LOL! Hop on on over to the Secret Identity Giveaway post and share your pet's alter-ego secrets for a chance to win a $30.00 gift certificate to my Etsy Shop. 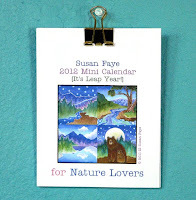 The two runners up will each receive their choice of one of my new calendars, either Cat Lovers or Nature Lovers (a $14.00 value).Giveaway ends November 13. At 8 p.m. Question: Does your pet have a secret identity? Are you ready to reveal your own pet's secret identity? Member of a motorcycle gang? Master Gardener or Soccer Star? Based on your pet's characteristics and special qualities, tell us in 50 words or less what his or her secret identity is in the comments section at the end of this post. Multiple pets in one household count as one entry. Don't have a pet? Use the pet of a friend or relative. Entries will also be accepted in an identical post over at The Hive. Each person who leaves a comment will be entered into a drawing to be held on November 13. At 8 p.m. PST on that day, three names will be drawn at random. The first name drawn will win a $30.00 gift certificate to my Etsy Shop. The two runners up will each receive their choice of one of my new calendars, either Cat Lovers or Nature Lovers (a $14.00 value). Bonus Entry #1: Become a follower of this blog (click "Join This Site" over there in the right-hand column), and once you do, please leave an extra comment at the end of this post saying you have done so. Already following? That counts too! Leave an extra comment to that effect. 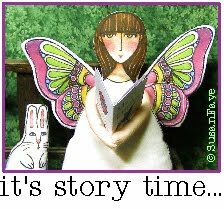 Bonus Entry #2: Become a "liker"of my Facebook page: http://www.facebook.com/SusanFayeArt, then leave an extra comment at the end of this blog post saying you have done so. Already a "liker"? That counts too! Leave an extra comment to that effect. You may post a picture of your pet in their alter-ego guise on my facebook page! Please make sure that I have a way to contact you if you are the winner, such as a link to your blog or e-mail address included in the comment. You may send the info directly to my email if you don't want to make your contact info public. Cat Lover No. 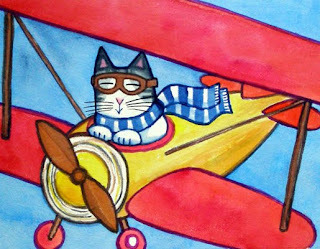 72 was first featured on 365 Cat Ladies on November 14, 2009. She introduced us to one of her very favorite paintings: "Woman With Cat" by impressionist painter Lilla Cabot Perry (1848-1933). To take a peek at this beautiful painting, and to learn more about the artist, visit The Pet Museum website and enjoy the article Orange Cat, Left Shoulder. Own a piece of 365 Cat Lady history! 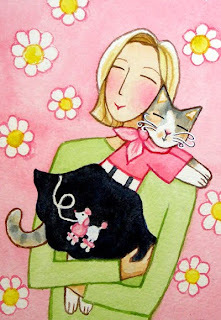 My original painting of Cat Lover No. 72 is now available for purchase in my Etsy shop! 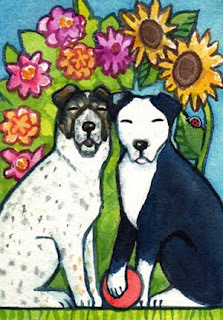 This mini watercolor painting is in ACEO (Art Card Editions and Originals) format, which means that the artwork size is 2.5" x 3.5", the same as a baseball card. It is hand-painted on super-heavy Arches 300-lb. acid-free cold-press watercolor paper with professional quality watercolor paints. Click here for more details. by artist John Boak. 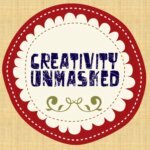 His website and blog contain great ideas using scraps of paper and found objects from around your house to embellish your gifts in the most creative ways. Please allow an additional 5 days for wholesale/bulk orders, items that will be personalized, or special requests. Each item is individually hand-made by me (or one of my helper elves) and although I try to anticipate customer needs and keep my inventory up-to-date, I sometimes run out of certain materials and/or certain items by early- or mid-December. If you have your eye on a particular something for a particular somebody, there is no time like the present to procure your present! Thank you for your continued support of my creative endeavors! Own a piece of 365 Cat Lady history! 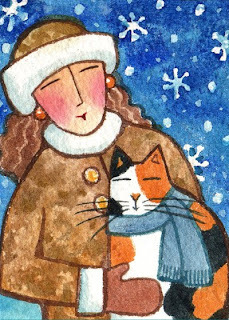 My original painting of Cat Lover No. 81 is now available for purchase in my Etsy shop! 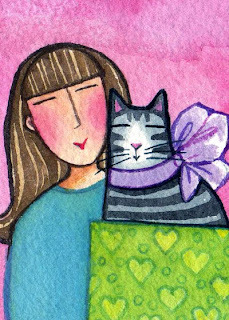 This mini watercolor painting is in ACEO (Art Card Editions and Originals) format, which means that the artwork size is 2.5" x 3.5", the same as a baseball card.